About one and a half months ago, I visited the library with no specific book in mind to borrow. While browsing through the shelves, I was captivated by a pink colored book titled "Live it, Love it, Earn it!" by a female author. 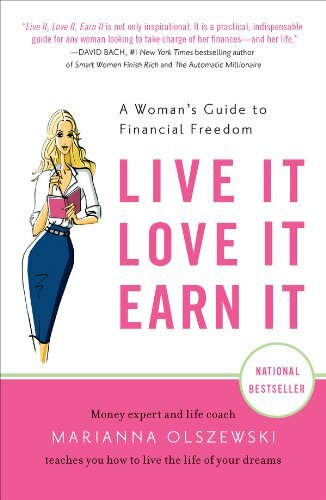 The thought about understanding Personal Finance from a woman's point of view struck me. Anyway, I am always reading books written by male authors and its time for a change. Being a father with daughters, raise my interest further. Marianna Olszewski is the founder of Madison Financial Management, which helps raise money for hedge funds. She grew up in a cash strapped family before climbing her way to the upper echelons of Wall Street and exceeded all her goals at the age of 30. "I wanted to share everything I've learned about managing money and following your dreams. I wanted to empower women to focus on what they really want, how to get out of their comfort zones and act." "Women just think differently about money than men. They make it more emotional than men...."
"The book includes insights from successful and fulfilled women like designer Diane von Furstenberg, Jimmy Choo shoe mogul Tamara Mellon, Congresswoman Marsha Blackburn and more. All these stories are to help empower women." "Live in the moment! Enjoy every minute with your kids and your family but also enjoy the time you spend working on your business or pursuing your dream career." In this book, you will find no difference from many other personal developments / financial books reiterating the usual advices as follow. For examples, the importance of good health, good education, family wellbeing, work life spiritual balance, follow your passion and dreams, self beliefs, be the person you want to be, pursue thing you are really good at, focus on your goals, prioritize, be positive, ignore narrow thinkers etc. In terms of managing finance, you will frequent calls on; the need to be frugal, save, invest, less debts, keep track of expenses, plan for retirement, emergency funds, insurance, trusts, wills etc. Yes most of us already know! Those advices I felt more noteworthy to highlight or maybe also more “feminine”, is as follows. Marianna felt that we are responsible for what we say. Most of the time, we have the choice to say no to request we are not obligated to fulfill. And when we say yes to something that we do not have to do, then we have to complete it without complains. "Say "no" to invitations or activities you don't necessarily enjoy or want to do so you have the time to say "yes" to yourself and your dreams!" It is important to be attentive to our intuition and instincts. They can often help us steer clear danger, without us knowing in the beginning. Hence sometimes, it is important to trust your instinct and do not even start or try. "Our instinct tells us this is not really a true sincere friend, yet how many times we must talked to ourselves into believing they are our friends even when they backstabbed us with evidence. How many times your instinct tells you this is not really the job for you, yet, you go against your instinct and jump into the job due to the pay rise or because you really want to leave, and then later regret your action." Do not ever disclose too many of our own personal info online or have posts showing revealing pictures of yourself. People who keep procrastinating will eventually find that what they desire for are sometimes only a temporary state of fun, that does not last or not important at all. Very often it will then go back to our not-so-fun daily life again, and then you will seek for the next object. The journey can be more important than the destination! For E.g. Reading, swimming, jogging, blogging, go to gym etc. These are activities that you can do anytime as and when you like. Liaising with friends for badminton, tennis, soccer etc is a harder task. Being organized, neat and tidy is important. Not only be organized in your work, be organized in your room also. Pack your own room and get rid of anything that you do not wear or use anymore, or that is broken, outdated, ugly and has outlived its usefulness. Stop accumulating things that we do not need! "Being very organized is the secret. Each night before I go to bed I list all of the things I need to do the next day. My days are very full but very balanced! It all works!" “The only way possible is to always put my family first and rest will fall in place.” It is so easy to become busy with work being exciting, but end of the day, the most important thing is the health & happiness and family and friends." “Femininity is a woman’s characteristic sense of fun, spontaneous and creativity. Use your feminine energy to get noticed” - Elisabeth Webb, CEO of La Vida Femme. Many women give up what they really want in life or in their career because of a guy he barely identify as a new boyfriend. That is stupidity! There are times to speak up and time to shut up. For example, speak up for what you really want in career or for justification of your work effort, such as a pay raise, promotion etc. If you do not speak up, please do not blame your superior for not noticing or take for granted. Once you speak up, there are times to Shut Up! Once you ask for what you want, then stop and listen for respond. Do not keep going a list of reasons why you need a pay raise to sustain your needs. Your employer will feel irritated eventually. Find someone who has gone through what you are going through successfully and ask them how they did it. Solutions and Ideas Matters More than "I can do anything!" During Interview, the employees that come with ideas and solutions are more important than those who say they can do anything. Circle the worry. Write it down and acknowledge them so that we can think about it later. Do not get distracted with what you are doing now. What already happened happens. Reverse the worry. Worry: What if I go all these interviews and never get a job…. Reverse worry: What if I go all these interviews and all of them offered me a job, how to choose. Stop thinking about it and keep on worrying! Stop overthinking and over-analysing! Stop all what ifs, if they were already being considered. Just dived into it and do it. Mixed with successful people, act and behave like them without being phony and fake. Adapt their good traits and habits into your own style. No one is asking you to be fake and snobbish, it is just continuous improving and educating yourself. Also start believing everyone is better than you lead to despair, discouragement and defeat. “Gratitude is riches. Complaint is poverty” – Doris Day, American Singer and actress. Give, but from a happy heart! Do not do charity and starting feeling heartache to see your money part! Then you are not ready. Giving must be genuine and you must only do it when you are ready and must feel comfortable. Do not compare the amount you give. It is absolutely not important. Overall I reckon it is a good book to read. And like what I already mentioned, understanding the “same thing” from a woman’s perspective can be different. Towards the end of the book, the author also encouraged us to write a “5 Year Letter”, post date it to 5 years later and then open during that time. Write as if it is 5 years from now in present tense, describe what your life is like, with as many live it, earn it details, dreams realized etc.